But first, let’s reproduce what the junior home minister who also hails from Arunachal Pradesh has to say: “Deputy Commissioner of West Kameng Dist adorns local costumes and serves the people. She has won their hearts!”. 1. 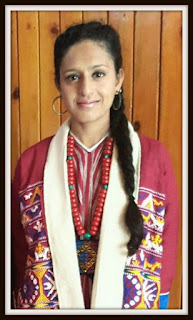 Dr Sonal Swaroop is a 2012 batch AGMUT cadre IAS. 2. This 32 years old IAS officer originally belongs to Rajasthan. 3. Before getting into IAS, she did her MBBS from Delhi’s Maulana Azaaad Medical College. 4. In civil services mains examinations, she opted for medical science and public administration and cleared it to be an IAS. 5. After getting into IAS she told IAS aspirants that newspaper reading, especially editorials helps. 6. She believes, in UPSC examinations, more general knowledge and simple mathematics skills are required. 7. She served as sub-divisional magistrate (SDM), Vasant Vihar, Delhi before moving to Arunachal Pradesh. 8. Last year, she was posted as deputy commissioner of West Kameng district of Arunachal Pradesh. 9. With Bomdila as its headquarters, West Kameng district has a population of 83.9 thousand people, according to 2011 census. 10. The district is inhabited by major tribes like Bugun, Hrusso, Monpa, Sartang, Sajolang and Sherdukpen. After ten years of active service in Arunachal Pradesh, this particular IAS officer will also apply either for a central depuatation or an inter-state deputation so as to move away from North Eastern India. So much so for so called commitment as a public servant. She is from AGMUT cadre,hence has to be transferred out of Arunanchal after completion of her tenure.But her efforts to identify with the local populace should be appreciated.A small but important initiative. I am the local guy from here and i wish she always remain here with her charismatic and dynamic way to run d administration. PEOPLE are so happy with her way of work... A True Bureaucrat. Im so happy that i got an opportunity to met her.. May Lord Buddha always bless her.. I never write on such forums and this response too, I consider incidental..as I happened to browse through my morning dose of the eclectic.. The above is a qualifier to the fact that the contributions of this Civil servant are so much worth the praise that I was forced to respond. I am working with the National Oil and Gas major and got the distinguished opportunity to serve my term in NE. Having my roots in a religion where community service is cardinal to my existence, I got absorbed with the local communities as I got a gate entry through a well disposed CSR. In addition to this the DC seems to have excelled in other elements also e.g proactive approach, alacrity, foreboding, OOB (Out of Box) thinking etc which are part of the administrative skill set acquired and honed in the process of likely professional grooming and would more or less be demonstrated across the country by others as well.